Wags & Wiggles most popular program for 20 years now available online, for all dogs and puppies of any age. Love your dog, but not his or her behavior? Would you like your dog to be the most well-behaved in the whole neighborhood? Wags & WIggles can help you achieve your goals through online positive reinforcement dog training! We strongly believe in giving both the human and dog ends of the leash positive feedback during learning and use a combination of food, praise, toys, real-life rewards, and clicker training. This Wags & Wiggles Membership gives you access to the courses necessary for a well-trained dog! Every course takes you from the very beginning of developing the behavior to adding the cue, working through distractions, to real-life training. At the end of each course, you will be issued a certification of completion. 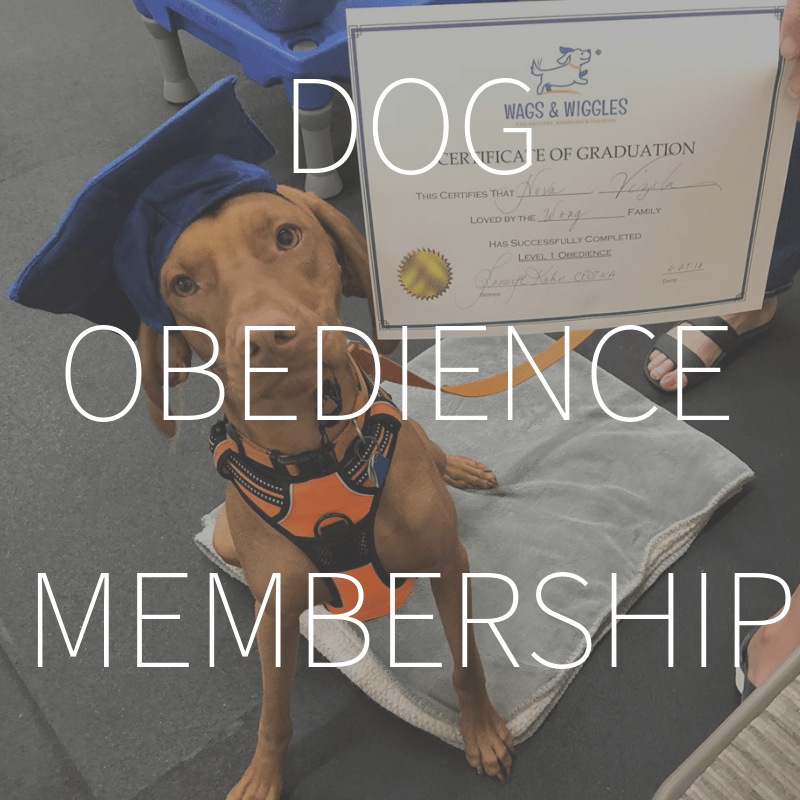 At the end of the entire program, you will be issued the Wags & Wiggles Online Obedience Graduation Certificate. Each lesson in each course will need to be marked complete in order to earn this certificate. The courses in this program are various lengths. Some courses are shorter and can be mastered in a weekend. Other courses are longer and may take up to 8 weeks to complete. You will have access to this material for 1 year from the time of purchase. Want personalized feedback from our certified dog training instructors? No problem! You can comment on individual lessons or submit videos for feedback. Our current price of $199 will increase when our Spring 2019 Courses are released, so the time to buy is NOW! 13 COURSES FOR $199 - SAVE $196! Wags & Wiggles trainers film each behavior using demonstration dogs. We break down every lesson so you can see how we overcome problems successfully! Get individualized support from Wags & Wiggles certified instructors. Submit your own training videos for review, ask questions, and see advice given to other students. Learning how to train your dog is quick and easy through our online dog training classroom! Clear and concise instructions with options. Train at your leisure! The Complete Guide to Dog Training is included for free! Wags & Wiggles covers fundamental topics including clicker training, building behavior, and problem solving. You'll save over 50% by purchasing our online Dog Obedience Membership. In addition, you'll have one full year to finish all of the courses included in this membership!